Self-nucleation (SN) is a special nucleation process triggered by self-seeds or self-nuclei that are generated in a given polymeric material by specific thermal protocols or by inducing chain orientation in the molten or partially molten state. SN increases the nucleation density of polymers by several orders of magnitude, producing significant modifications to their morphology and overall crystallization kinetics. In fact, SN can be used as a tool for investigating the overall isothermal crystallization kinetics of slow-crystallizing materials by accelerating the primary nucleation stage in a previous SN step. Additionally, SN can facilitate the formation of one particular crystalline phase in polymorphic materials. The SN behavior of a given polymer is influenced by its molecular weight, molecular topology, and chemical structure, among other intrinsic and extrinsic characteristics. 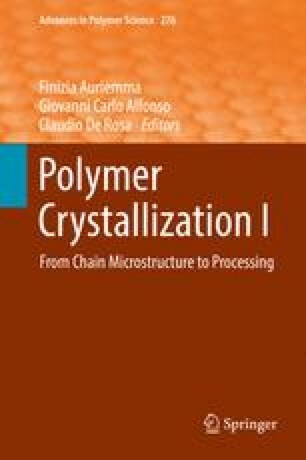 This review paper focuses on the applications of DSC-based SN techniques to study the nucleation, crystallization, and morphology of different types of polymers, blends, copolymers, and nanocomposites. The POLYMAT/UPV/EHU team would like to acknowledge funding from the following projects: “UPV/EHU Infrastructure: INF 14/38”; “MINECO/FEDER: SINF130I001726XV1/Ref. : UNPV13-4E-1726” and “MINECO MAT2014-53437-C2-2-P”.